There are good reasons to rethink how we organise the school curriculum. An alternative would be to structure the curriculum as a sequence of proficiency levels unrelated to age or year level. Currently, the school curriculum is packaged into year levels. For example, a Year 5 teacher is expected to teach the Year 5 curriculum to all Year 5 students who are then assessed and graded against Year 5 curriculum expectations. The problem with this approach is that, in each year of school, students are at very different points in their learning. The most advanced 10 per cent of students are about five to six years ahead of the least advanced 10 per cent of students. This means that less advanced students often are presented with year-level material that is much too difficult. For many students, this occurs year after year. Some fall increasingly far behind with each year of school. By 15 years of age, large numbers of these students fail to meet even minimum standards of reading, writing, mathematics and science, and many have essentially disengaged from the schooling process. At the same time, more advanced students often are presented with year-level material that is much too easy. Many achieve good grades on year-level expectations with minimal effort. These students fail to make the progress and attain the levels of which they are capable. By 15 years of age, the top 10 per cent of Australian 15-year-olds in mathematics perform at about the same level as the top 40 per cent of students in some other countries. The attempt to specify what an individual should learn on the basis of their age or year level flies in the face of what we know about learning itself. Successful learning is most likely when learners are presented with appropriate levels of challenge. Learning is far less likely when challenges are within students’ comfort zones or so far ahead of them that they are unable to engage meaningfully and so become frustrated. In short, the way we organise the school curriculum (and the way most of the world organises the school curriculum) is not consistent with what we know about the conditions for successful learning. The current curriculum is not designed to guarantee teaching at an appropriate level of challenge for each and every learner. An alternative would be to structure the curriculum not in year levels but in proficiency levels, where a proficiency level is an absolute level of attainment or competence in an area of learning, regardless of age or year of school. Click here to view an enlarged version of the diagram below. The reorganisation of the curriculum in this way would be a radical departure from current practice. It would require a change in mindset – a different way of thinking and working for teachers, students and parents. What it means to learn successfully would be defined not in terms of year-level curriculum expectations, but with reference to a hierarchy of proficiency levels through which students would progress throughout their time at school. Although this way of thinking would be new to the school curriculum, it is a familiar concept in learning areas such as music, second languages, swimming and (Kumon) mathematics, where students progress through a sequence of proficiency levels not linked to ages or years of school. A sequence of proficiency levels provides a frame of reference for identifying and communicating the points individuals have reached in their long-term learning at any given time. This is potentially valuable information for students, teachers and parents. If proficiency levels have the same meaning across schools, year levels and over time, they can be used to identify and report the levels students have reached and to set appropriate goals for further learning. Considered together, proficiency levels make explicit and illustrate the nature of long-term progress in a learning area. When learning is undertaken in relation to a set of proficiency levels, and teachers assess individuals to establish the highest level they have achieved and the level they need to work on next, it is more likely that individual learning needs will be identified and addressed. Currently, accurate information about where individuals are in their long-term progress is often lacking. When teachers interpret their role as delivering the same year-level curriculum to all students in the same year of school, they often overestimate the abilities of less advanced students and underestimate the abilities of more advanced students. The value in establishing where students are in their long-term learning is that teaching can be better targeted on current levels of attainment and learning needs. Knowing the level a student has reached makes clearer what they need to work on next. This is likely to be more effective in promoting learning and raising standards in our schools than simply delivering the same year-level curriculum to all students regardless of their levels of attainment. A set of proficiency levels provides a basis for monitoring and reporting student growth. Teachers, students and parents are better able to see and appreciate the progress individuals make as they work through a set of proficiency levels over time. In contrast, current school reports generally obscure long-term growth. A student who receives the same or similar grade year after year is given little sense of the absolute progress they are making. 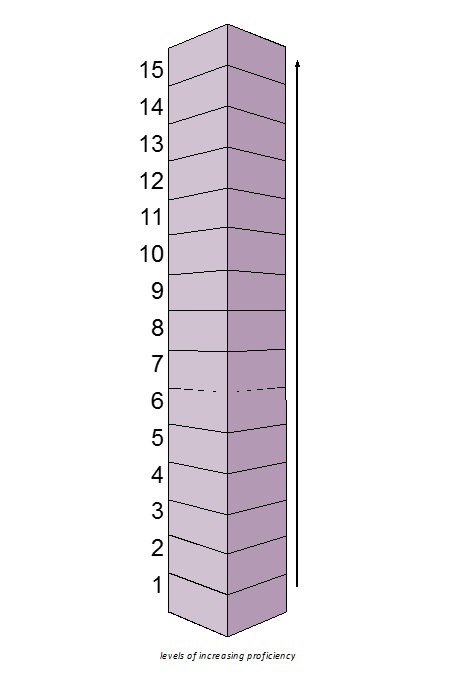 Proficiency levels also provide a basis for identifying and specifying absolute levels of attainment required for particular purposes – for example, the minimum level of reading required to function effectively in the workplace, or the minimum level of mathematics required for entry into a particular course of study. When minimum levels of proficiency are specified in this way, it is possible to monitor over time a student’s progress towards the achievement of these levels. A more explicit focus on long-term progress in an area of learning encourages a greater emphasis on skills, understandings and attributes that develop across the years of school. These include understandings of key concepts and principles, higher-order thinking skills, personal attributes and general capabilities such as problem solving. A sequence of proficiency levels conveys the nature of such long-term learning and development, sometimes referred to as a learning progression. This focus on deep, long-term learning may be less evident in curricula packaged into year levels. The approach Australia has adopted to improving student performance is to specify year-level curriculum standards and to hold all teachers and students accountable for achieving those standards. This clearly is not working; there has been a significant decline in the reading and mathematical literacy levels of Australian 15-year-olds since the turn of the millennium. Each year, some 40 000 15-year-olds have reading levels below the OECD’s minimum standard for effective functioning in society. More than 57 000 have mathematics levels below this minimum. Most of these students no doubt have struggled with, and fallen below, year-level expectations throughout their schooling. A common response to these observations is to propose higher year-level expectations. But this misses the point. Because of the wide variability in students’ levels of attainment, any single year-level standard, wherever it is set, will be inappropriately easy or unrealistically difficult for a large proportion of students. It is also sometimes considered ‘equitable’ to set the same learning expectations for all students in the same year of school. But there is nothing equitable about expectations that are at an appropriate level of challenge for some students but at an inappropriate level for others. An equitable system would be one in which every student was provided with stretch challenges appropriate to their current level of attainment and in which every student was expected to make excellent progress every year – regardless of their starting point. Such a system also would be more likely to produce a lift in our national performance. Editor's note: This article was updated on 21 February, 2018 to include the diagram. Just what would this look like in the classroom? I agree with the premise of this article but how would it work practically? Vertical streaming would seem a natural way but does this work socially? Having had a son in a class with others up to 2 years older I saw that this did not work. We need to balance the academic and the social. Also, teachers have problems differentiating successfully now, if they were expected to deliver different proficiencies in one room you are just adding to their workload and stress. In order to do this suggestion successfully, we have to completely re-think how schools are organised. It would be great if we had teaching schools where we could experiment with stuff like this. I can’t see most risk-averse schools signing up to such a different way of doing business. I suppose that one of the justifications for organising classes roughly by age is to allow students to study with their peers who are about the same age. I imagine that people are more comfortable in working with others about the same age. Look at the seating patterns in a university lecture theatre - younger students sit at the back, older students sit at the from - and it has nothing to do with their eye-sight. Men and women are about the same age when they get married, at least for the first time. It takes a fair amount of commitment to move out of one’s comfort zone into a class of much younger people. Thank you for the thought provoking article. I attended Dubbo Public School in the 60s and we had a vertical plan each morning for Reading, Spelling and Maths. The school was divided into 13 groups and you were placed in a group that would challenge you. Maths classes were limited to 4 groups so that students did not miss steps to understanding different concepts. As a result in year 4-6 I learned my spelling and reading in groups 12 and 13 which meant there was a greater challenge and i was working above my cohort. I have never understood why this type of learning did not become more common. By the time my own children went to primary school they were in a mixed ability class and spent much of that time frustrated. I have taught Visual Arts and Drama most of my career and find that within those disciplines one can set individual challenges. Teaching other subjects ‘like an artist’ might be a step in the right direction. Sounds like Outcomes Based education (OBE). Are we really to go down that path again? I suppose that Maths Pathways attempts to accomplish what is proposed in the article.. If the morning hours were devoted to English and Maths, where the Year 1 teacher takes the Level 1 students for English, then everyone moves to their Maths level class, the teacher no longer needs to differentiate between abilities and can teach the same thing to everyone. The differentiation would then come from the different ages and ensuring that the older and younger students recognise that they can be as successful here as everyone else. If the statistics of age-achievement gaps are anything to go by, your class of 27 Year 1 kids will be spread out over P-3 levels and it’s highly unlikely that a levelled class would be 90% one age, with a few outsiders. After English and Maths, the Year 1 teacher could take all the 6yos for the afternoon to deliver the rest of the curriculum, which is easier (not easy but easier) to deliver to students of different literacy and numeracy levels. The kids still get their peer time and yet, the core skills are delivered at a level that is appropriate. The only issue I can actually see is that students must be allowed to move between level classes at the end of each term at least, so that we don’t lock them into a level they are beyond and so that students who are “behind” have the opportunity to actually catch up. From my observations in schools, kids who don’t understand the content in age-level classes “know they’re dumb” and appreciate being able to “beat” others on tests sometimes, even if their classmates are mostly younger than them. Those on the other end are often initially resistant to being placed in harder classes because everyone enjoys the opportunity to be lazy and “win all the time” and yet, they do eventually appreciate not being bored in class and Australia will benefit from their potential. You’re right that schools can’t implement this without placing students in levelled classes, but those classes don’t have to take the whole day. That is not the intention. Outcomes Based Education (OBE), as promoted by Spady (1994), is focused on specifying what students should be able to do at the end of a given period of instruction – for example, an educational course or a traditional year-level curriculum. It is not a different way of packaging and presenting the curriculum as described here. The only possible link to OBE is the focus on WHAT students learn and HOW WELL they learn, rather than on WHEN they learn. This is not workable. In all my years in a classroom I have never had a child who was 5 to 6 years (as claimed here) above their year level. These children have simply not covered the curricula of those years above where they are. I’ve experienced the montessori classroom and it has a 3 year cycle of learning. Works fabulously to cater to the variance in levels. Another method that would support this would be lower student to teacher ratios, I have read that 3 teachers per classroom would also allow different student learning levels to be met. But is this comfort in working with others of the same age a natural instinct or is it the result of our age-based schooling system? We’ve been trained from a young age, for many generations, to stick with people our own age. If schools are organised in a different way, perhaps your observations would change. 2. The having the kids streamed is not good for them socially (or academically). Both of these fears have some validity but are easily overcome. Kids should be with their comfort group. This does not necessarily mean age group but often is. This of course means that the students in a class will be at different stages of learning, which is in fact no different from the current conditions. This means that we have to teach for different stages of learning within the same class. The first problem cited. This is actually less of an issue than people expect IF 3 conditions are met. The first being that the teacher has knowledge of each student’s stage of learning, and secondly that the stage of learning is characterised by sufficiently broad descriptors as a cognitive continuum, rather than highly focussed content descriptors. In other words so that you can teach the same broad content to the class or at least large parts of the class, but focus individual learning on the stage of learning for each student. The third requirement is that the curriculum is constructed as problems, tasks, assignments etc so that the teacher can spend sufficient time with individuals to progress their needs. The kids should be doing the work, not the teacher. The teacher should be meeting the individual cognitive needs for the students to do the task. I have done this over a 5 year period in a low SES ‘difficult’ school and it worked. Kids were more motivated and self disciplined in that period. Since then I have tried to maintain the process without the first 2 requirements in place. It was possible but much much more difficult. What @Geoff Masters is suggesting, if done well will support the first 2 requirements for this way of teaching to be doable. Geoff, OBE is not the same as the curriculum you are suggesting, I agree, but the Outcomes Approach developed in Queensland in 1999/2000 provided an excellent starting point for curriculum structured as continua because it clearly described the learning expected/desired/hoped for at the end of year 10 and interim stages of learning were described NOT linked to year levels. For what you are suggesting to work the nexus between relative achievement and ego/self-esteem/self-efficacy needs to be broken BOTH for teachers and students. This is the big barrier to its success. This also needs to be top-down, meaning that politicians/bureaucrats need to understand that there is no nexus, then administrators, then teachers. If that happens it could work and work extremely well because it will make it much easier for teachers to meet the students’ psychological needs for motivation that are thwarted in the current system. Country schools manage well with big age differences between students. Big schools may be a different kettle of fish. Rebecca here has put forward the Montessori 3-year cycle. Three teachers per classroom is probably unaffordable. In every classroom in the UK you have an Aide and this assistant is separate from any funded Aides for disabilities. (They also do the yard duties - that’s the bit I always liked.) I think the variation in classroom ability or level is not as great as it is suggested here. We should not go down the route of dovetailing into supposed needs on either side of the bell curve too much. Children who are on the lower end of skills are quite well catered for these days and the purpose of it is to lift their levels so they can cope better within the majority ability levels. And if a child is way ahead then set up gifted children’s extra classes. The Post seems to be leaning towards Competency Based Learning where each student will be ticked off on each module independently of the class. I’m not in favour. I believe the article indicates that could be the spread of grades represented in the class. There is certainly an expectation for teachers to teach the current grade, plus one or two above AND below… this equates to three to five years of stretch. Children who are more than two standard deviations outside the norm in IQ generally operate around two grades away from their peer group (up or down), and three standard deviations three to four grades is not uncommon. These children have to sit in a class with age peers, and stare at the carpet in confusion (or boredom) until the teacher can make time to differentiate for them (which a great many teachers do not have the training, time or let’s be honest… inclination sadly… to do). As a curriculum leader I trialled this in a year 1 to 6 environment for 6 months with reading. From the initial testing we had year 1 students achieving the year 6 standard and year 6 students achieving the year 1 standard. We couldn’t do this to the students so manipulated the classes of the most extreme learners to ensure students didn’t feel out of place. After 1 term many students improved and moved to a more challenging class, especially the older students. I believe that using this process from the beginning of a child’s schooling would eliminate many of the older children requiring teaching at a year 1/2 level. It is a very exciting option, one that many change-resistant teachers/leaders wouldn’t cope with, I’d love it though! Wow, thank goodness someone is saying these things in this article besides Finland… Great article, can we get some action on this please! Templestowe College, my daughter’s (public) high school here in Melbourne, operates a Flexible Learning Environment which abandons year levels between Entry (yr 7) and VCE students to teach to proficiency. (Children can start the VCE when they are ready to do so, not when they age into Year 11 per se.) Not being an educator I can’t say how closely TC’s approach parallels the one outlined here, but the need to abandon age-based teaching is one that has been obvious to me since my own primary school education in the 1980s. For that reason we chose a Montessori primary school for our daughters, and found the three year cycle works sublimely to encourage children to work with others who are at their level, not just their age. (They also learn to mentor others, and are motivated by the children working at higher levels than they are.) Nor does Montessori limit itself to a three year curriculum as many seem to think: “follow the child” in the case of my daughter meant bringing in grade one and two work when she was in prep, and high school work when she was in grade five. It used to be called ‘streaming’. The problem is that there is a disconnect between curriculum design in Australia and educational policy. Mercifully, the curriculum, though skewed towards literacy and numeracy, has a student-centred learning approach - individual student needs are the focus of learning. However educational policy in Australia is different. It is focussed on learning outcomes - what students, largely as a statistically measurable cohort, know. This is almost exclusively based on their collective achievements in numeracy and literacy. No-one really cares about individual needs. Children gravitate to others who are much their own age, because they share common issues, interests and abilities associated with that age. So even in multi-age classes, students tend to befriend those who are much their own age. If we are focussed (as the curriculum is) on individual needs, we will consider students’ personal, social, ethical, intercultural, artistic, musical and physical needs and their preferred learning styles (as the curriculum does), not just their ability to stride upwards on PISA graphs in a narrow range of learning areas. You suggest that such streaming brings us forward into the 21st century, but in fact it simply plays into the ‘student as competitive, capitalist fodder’ narrative which consumes our society at the expense of the individual. Teachers are trained to cater for the needs of the range of students in their class using open-ended tasks that can provide both cohesion and address individual learning requirements. Largely they do a fabulous job in this regard. Individual student needs will all be different, whether you stream students or not. Let’s not. Let us please, never again, turn to page 34 in the maths text book because that’s where we all are now we’ve been streamed. It’s really lazy teaching. We are all better than that. We have amongst the best curricula in the world. Let’s actively support it and all the individuals it seeks to nurture. In the U.K. we moved from a ‘levels’ based assessment system to a ‘mastery curriculum’ with a focus on moving pupils to a greater depth os knowledge, skills and understanding across the curriculum. It might be of interest to you to consider and compare the two different approaches? The approach to fix the situation is going to be more work and stress for teachers regardless of what we do, that cant be avoided. The system currently is useless and getting more useless the longer we keep it. Teachers need more support however to handle the change as it will be a massive burden. I would rather have this system in place, than what it is now. I feel that the social side of things can be addressed in other ways. Mixing with older and younger students should not be something that is avoided. Finding ways to balance that out is a challenge though, and needs to be considered as you said. I know we always find it easy to say “but in finland..”... And as I do love the small isolated system they have in the tiny country of Finland, applying that to our diverse system is 100 times more complicated. However it does work and they deal with the same worries that you have addressed here rather effectively. However their teachers get qualified differently, and have a different mind set when they enter the classroom as compared to our new teachers, who probably have ‘panic” as their mindset when they enter the first 5 years of teaching in our schooling system. MY point is change needs to happen and it is going to be painful no matter what it is. The other point, teachers need more support to do this other than just some time off for PD to discuss overviews of curriculum changes as have been done in the past. Perhaps this i what the teacher’s union should be pushing. If not them then who?